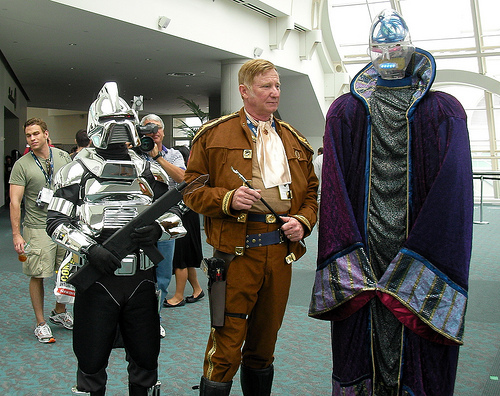 Many ComicCon attendees are still recuperating from the four days (for some, all week) of fun and imaginative madness. Now that we’ve had a time to take a deep breath and settle down, people already are prepping for C0micCon 2010, which promises to be even bigger, better, wilder, crazier — and the team at Ninthlink, PlanetIllogica, and all our friends and collegaues will be right there! 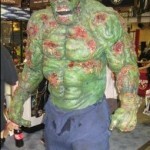 Zombies was a big thing this year — many were dressed in quick or elaborate make-up to look like goo-ozzing zombies, even a Zombie Hulk was seen. Zombies passed out flyers for zombie parties, zombie wanted hugs, zombies wanted to scare. Zombies came in from age 10 to age 50. Needless to say, fans just love the brain-craving undead. There were more parties going on than any one person could possibly attend. Opening parties, closing parties, industry parties — parties copen to the public and closed to a select group. At the Hard Rock Hotel, there was the Cowboy Party and the Wrath of Con party, which was given for celebrities and the press only. Of course, over at the Wonderhaus, we were there Thursday night for “Scribble08” and Fridaty for Planet Illogica. Celebrities were scattered all over the Con — getting a quick glimpse is always a treat. Nichelle Nichols, best known as Lt. Uhrua from Star Trek, was seen wandering around. Johnny Depp paid a surprise visit to promote his upcoming film, The Green Hornet, as was Robert Downey, Jr. and Scarlett Johannsen for Iron Man 2 (Scarlett will play Black Widow, part of The Avengers Team). Actors from Dexter, Weeds, and True Blood were on hand, as well a few familar faces for the director’s cut of Watchmen. Lou Farigno, the original TV Hulk, was in the dealer’s room signing autographs, with veryone asking him about his training Michael Jackson in the final days. Panels covered everything under the sun when it comes to entertainment — anything from the anthropology of Star Trek to new tecnologies for Internet comics. Workshops were held in comic book writing, drawing, voice over acting, to how to pitch a TV show, as well as comic books and the law, how to start your own publishing company and website, to spotlights on key figures in writing, drawing, and creating. Another major draw over the years have been the anime/magna rooms, showing the latest immprts from Japan and Asia 24 hours for 4 days. Mnay people, serious magna fans, come only to see these, and will spend all their time viewing products that have not been translated into English or won’t be available in the U.S. for a while, if ever — some are TV shows exclusive to Japan. Every major news outlet was on-hand: MTV, CNN, FOX, MSNBC, local, national, international. San Diego had the world spotlight in all things entertainment. Costuming is an integral part of the popular arts, from movies, comics, and fantasy art to computer games, stage shows, toy collectibles and more. For this significant presence in so many of the arts, and for being an art in itself, Comic-Con once again brings forth its big Saturday night show of impressive craftsmanship, beauty and spectacle. Costumes included characters from Star Wars, the DC and Marvel universe (and an amazing Hulk set-up), and original “characters” by costume creators. ComicCon officials are now hard at work gearing up for next summer, arranging for panels, features, and guests. Take heed: they are upping the price for 4 day passes, from $65 to $100.